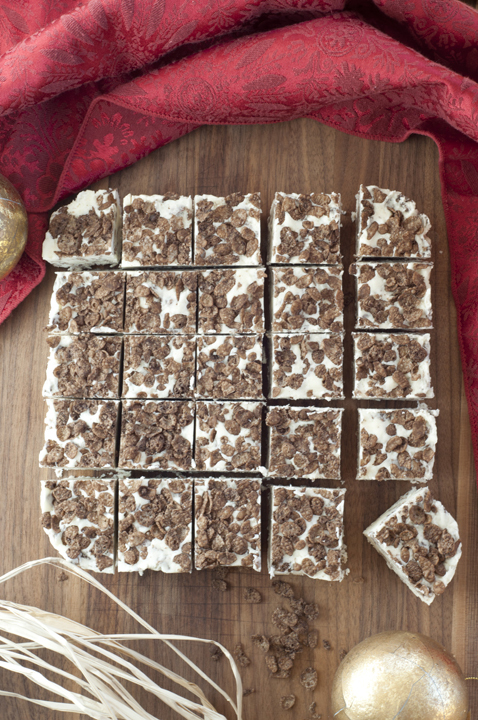 Make and share this White Chocolate Cocoa Pebbles Fudge dessert recipe with friends and family for an easy Christmas treat. It makes a great gift to give away for the holidays, but you will want to keep it all for yourself! If you have read my blog for any amount of time at all, you know it’s no secret that I am a kid at heart when it comes to food. There is just something that gets me all nostalgic when it comes to foods I ate as a kid….anyone else? I ate Fruity Pebbles and Cocoa Pebbles like it was my job when I was growing up. I still pick up a box at the store every once in a while (and hide it from my husband). If I don’t end up baking something with it, like this White Chocolate Cocoa Pebbles Fudge, I will just eat it the old-fashioned way with a huge bowl and some milk. I love incorporating cereal into my desserts! This White Chocolate Cocoa Pebbles Fudge is a nice alternative to traditional chocolate fudge and is SO easy to make. I frequently make white chocolate fudge to give as gifts for Christmas and Valentine’s Day because I am a huge white chocolate fan. I actually prefer it to milk chocolate (yup, I’m that crazy person in your life). 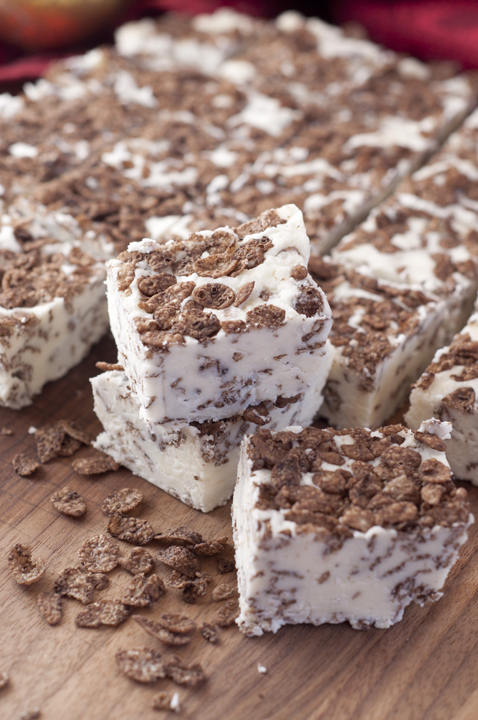 This fudge has the best of both worlds because it has BOTH white and regular chocolate in it. No need to choose when it comes to this! This is the white chocolate lovers’ equivalent to heaven. Creamy, sweet fudge that will be the perfect addition to your holiday dessert trays. Enjoy! If you like this White Chocolate Cocoa Pebbles Fudge recipe you MUST check out my Vanilla Cupcakes with Fruity Pebbles Buttercream Frosting (yes, for real!). I love baking with cereal! You will also love this and Cocoa Pebbles Ice Cream Cake. I made it for a friend’s birthday years ago and he still talks about it to this day! 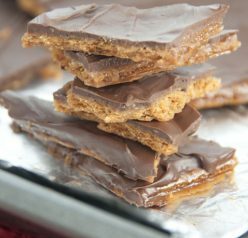 I also have my eye on this yummy fudge recipe from my friend Mary. Enjoy! 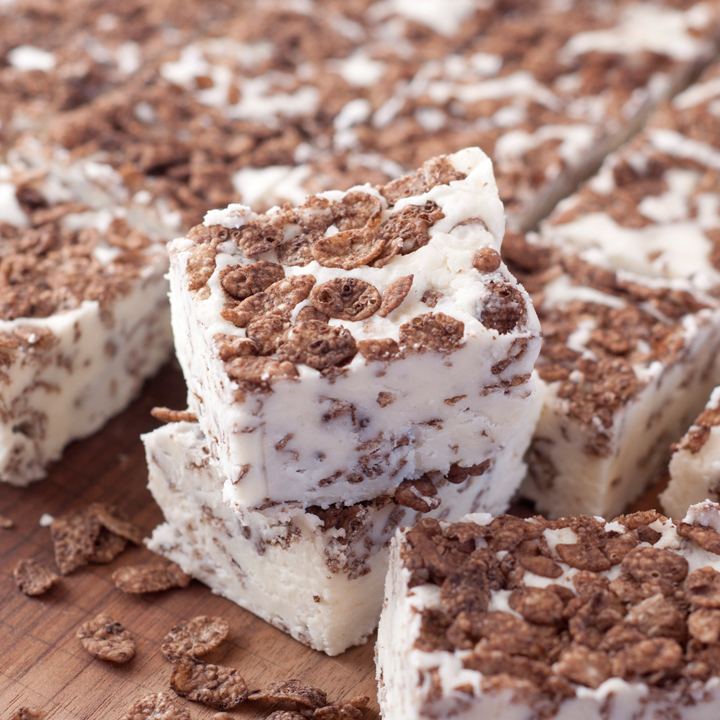 Make and share this White Chocolate Cocoa Pebbles Fudge dessert recipe with friends and family for an easy Christmas treat. Line an 8x8 pan with foil and spray with cooking spray. 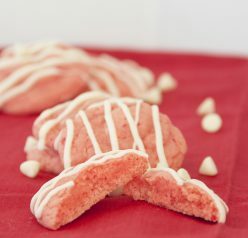 In the bowl of stand mixer or using a hand mixer, beat together cream cheese, powdered sugar and vanilla until smooth and fully blended. Melt the white chocolate according to directions on package. 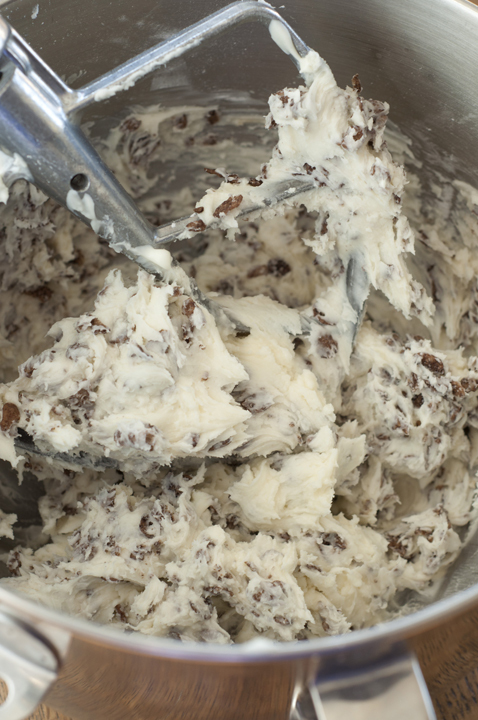 Pour melted chocolate into cream cheese mixture and mix together until mixed thoroughly. Turn mixer to low and stir in 1½ cups Cocoa Pebbles until mixed in. Press remaining ½ cup Cocoa Pebbles onto the top of fudge and press gently into the white chocolate mixture so they stick (some will come loose while you're cutting the fudge, but that's OK). Chill fudge for approximately 1 hour or until set. This will make it easier to slice. Cut into squares and serve or store in an airtight container for up to 5 days. This fudge also freezes well. Disclaimer: This recipe post is sponsored by Post Cereals. The words and opinions expressed in this post are strictly 100% my own, as always. Amazing idea! I bet this is a big hit with everyone who tries it! This fudge looks amazing! Although I’m not a big cereal eater these days, my box of choice was Golden Grahams. I’m sure that would making an amazing (s’mores) fudge!! What a fantastic way to incorporate cereal into your dessert! This is such a brilliant idea – not only does it look stunning – but it’s simply mouthwatering! It’s always fun to use cereal as an ingredient, isn’t it? It always add another dimension. This fudge is fun! And really flavorful, I’ll bet. Winner! Thanks. White chocolate and cream cheese?! Oh my. I would demolish this stuff. Even more so now that it has Cocoa Pebbles in it! Girl, I am loving your pictures! This looks so fun for the holidays! they bring me back to my childhood!! I definitely ate a lot of cocoa pebbles growing up! That and those cookies that were a cereal! I can’t think of the name right now! This fudge is just too fun! Cookie Crisp! Yes – loved those too! This is such fun fudge!! My kids would love it! Send me some of this for Christmas haha! 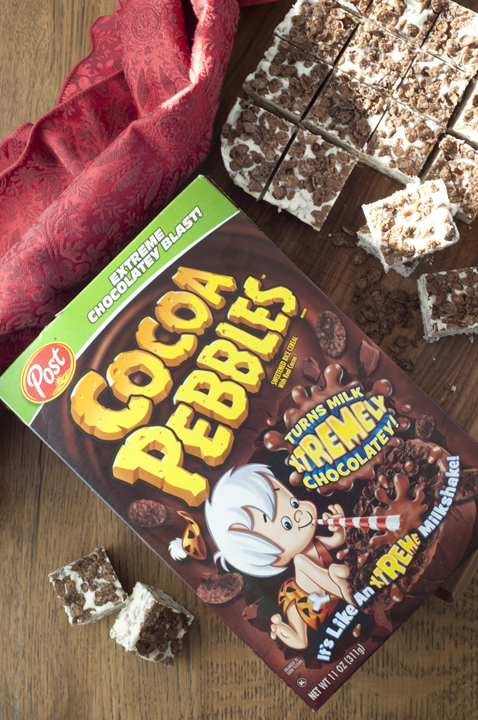 I love Cocoa pebbles and I bet it’s in fantastic in fudge! I’ a huge white chocolate fan too ! Just when you think you’ve seen every fudge flavor combo… WOW want. now. Yes! I felt little wistful just reading the title of your post. I lurved me some cocoa pebbles growing up. This fudge is so fun, and I bet it would be super pretty with a batch using fruity pebbles alongside it. This is so cute! The cocoa pebbles are the perfect addition! 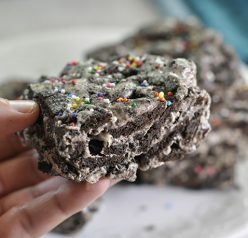 I can hear the crunch of this fudge just by looking at the pictures. What a fun recipe that I’ve never seen before! Kudos to you for coming up with something unique! I’m completely obsessed with cocoa pebbles and fruity pebbles. This is just so fun. I love everything about this recipe. It’s absolutely genius. I LOVE making fudge but it gets even better when you cover it in cocoa pebbles. Hello delicious!